14K Solid White Gold "In His Name" Bible Verse Ring. "In His Name" is carefully laser inscribed on the front of the ring alongside two ancient Celtic knot border designs. 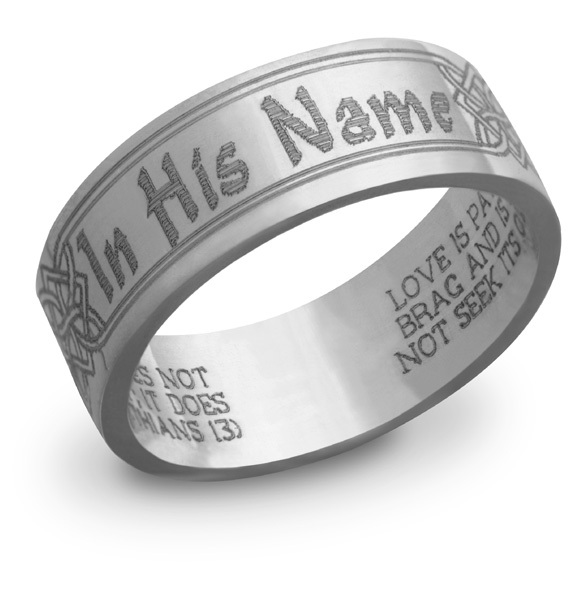 You may also put any other inscription on the front of the ring, such as your name, a favorite Bible chapter and verse number, or any message of your choosing! Customize the inside of your ring with Scripture, by choosing from our Scripture listing or adding a Bible Verse of your choosing! You may also personalized the inside with any other words of your choice, up to 225 characters! Available in 6mm, 7mm, and 8mm widths (shown in 7mm). We guarantee our 14K White Gold "In His Name" Bible Verse Ring to be high quality, authentic jewelry, as described above.